Our science this year is Apologia General Science. 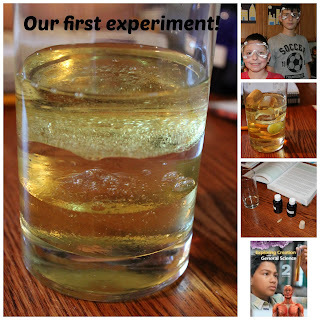 The kids are extremely excited to be doing so many experiments. They did their first one on the 2nd day of school! This was a study on density. I was so impressed at their questions and how many things they knew already. If your doing this course I highly recommend buying the experiment kit. We did have to add water, a glass, a small rock, ice cube and a grape but it was nice to not have to measure out any ingredients and find a cork!